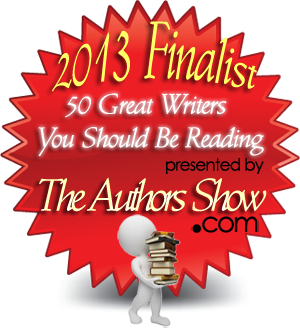 On September 18, 2013 we blogged an invitation to vote for Ian Moore-Morrans as he entered the first phase of The Authors Show 2013-1014 contest “50 Great Writers You Should Be Reading” which ended on November 1st. We greatly appreciate any and all votes cast. Enough of you did vote for him so that now Ian is a finalist in the second (and final) phase of the contest. This is an invitation to AGAIN VOTE FOR IAN in this final phase. Thanks in advance to those of you who will cast a vote for Ian. We are including a copy of Ian’s entry into the contest which asked for him to write about his journey as a writer. We hope you will enjoy it. Folks remark that I have a gift for gab and storytelling. However, whatever free time I had was taken up by music-making. Important as it was to me, writing took a back seat to making music. When schooling was over, I had to find a job. Working as an apprentice to a local blacksmith, I had neither time nor energy to write, though I earned some money and built up muscle. My free time was spent learning to sing and play an instrument as part of the Salvation Army. Music-making became my passion. Four years later I joined the Royal Air Force. Finally I had decent food, clothing and living conditions plus an opportunity to learn a trade—Flight Mechanic Engines—and to continue to play in a band. I served in England, Wales, Scotland and the Suez Canal Zone in Egypt. Being far away, I enjoyed writing letters home and hearing remarks about how exciting I made my life sound and how much folk learned from reading what I wrote. I was to benefit most by corresponding with my pen-pal. Mary and I kept up a steady correspondence and then met in Glasgow just after I returned to Britain. We were soon married. Whenever I had a chance at work or leisure, I told stories when I wasn’t singing songs or playing my trumpet. I fancied myself an entertainer but never thought of trying to earn a living at it. After five years’ service, I left the RAF. Not only did I have a wife to support; we were soon blessed with two daughters. I found work as a machine fitter in the steel industry around Glasgow. After awhile I applied for a clerk’s job in a big steel company. When interviewed, the supervisor mentioned that one of the biggest problems in the job was reading what someone had written. He asked me to write the numbers from 1 to 10 and also spell each one out in longhand and then print the words in capital letters. “Very good” he said, “at least we’ll have one person whose writing is legible. When can you start?” I couldn’t believe that was the test! Soon, my “penmanship” earned me a better job as a shift scheduler. Having been misled by the inflated promises of an unscrupulous Ontario official, we got “itchy feet” and headed for Canada. Arriving in 1965, we soon found that my promised machining job was not available, nor were we in a financial position to buy a house as we had been led to believe. After five years of misadventures finding and keeping jobs and suitable homes, we finally reached the level of prosperity we had had in Scotland. My family and I continued to live and work in Canada, moving almost every year to a different house, town or province (and different band) as jobs came and disappeared. I never seemed to have time to write down my stories, though I told plenty of them, both true and made-up. Finally, in 1995 at age 63, I decided if I didn’t start writing, I’d never do it. Next, I tackled my life’s story. Several times I’ve encountered people who heard my Scottish “burr” and then told me of Scottish ancestors. After inquiring, I would hear they had died and the family didn’t even know where in Scotland they had originated. Finally, I vowed to write my life story to avoid that state. Thus began the long process of remembering and writing into the wee hours of the night over the course of several years. I ended up with two volumes called “From Poverty to Poverty” and “Came to Canada, Eh?” Again, I submitted manuscripts which were politely rejected. In 1984, I taught an adult class for men who had metal-cutting lathes and wanted to learn how to better use them. I loved this first and only experience of formal teaching. Later, I wrote a “how-to” book about machining steel, written for the type of people I had been teaching. Completed in 1998, I called it “Metal Machining Made Easy.” I did all of the 60-odd illustrations by hand. This was published in 2002 through Writers Exchange in Australia. Shortly thereafter, my wife Mary died. I vowed to go on with life, continue to write but also to socialize and enjoy what time I had left. Then came the most significant encounter of my life. I started a conversation with an attractive widow about the eclectic assortment of stories I had begun writing after retirement. When I learned that Gayle was working as a magazine editor, I began to envision a future of our living and working together. We married in 2003 and, after she took an early retirement, we bought a motor home and set out to explore Mexico. While basking along Mexico’s Pacific coast, Gayle started editing my stories while I sat at the laptop and did re-writes, as well as writing a story of revenge called “Legal Hit Man.” Later moving inland to the mountainous north shore of Lake Chapala, we became residents of the world’s largest community of English-speaking expatriates. We joined the local writers’ group and met some wonderful writers from around the world. Soon my short story, “The Moonlit Meeting,” was published in a local magazine. Age has caught up with me. When I first started seriously writing, I sketched out a few notes and went to work with everything flowing fairly smoothly. I kept going at all hours and wherever I was. At present, after over five years of illness, it’s becoming harder to find the energy to write. Luckily, I have a number of manuscripts waiting for Gayle to work on. Then I read through edits, give my approval or comments, and let her do the rest. Aren’t I fortunate? This entry was posted in awards, Biographical info, Children's chapter book, Editing, Immigration/emigration, Life, marketing, memoir, Mexico, Music, Novel, Scottish theme, self-publishing, The Authors Show, Writing and tagged 50 great books you should be reading, audio program, vote for Ian. Bookmark the permalink.